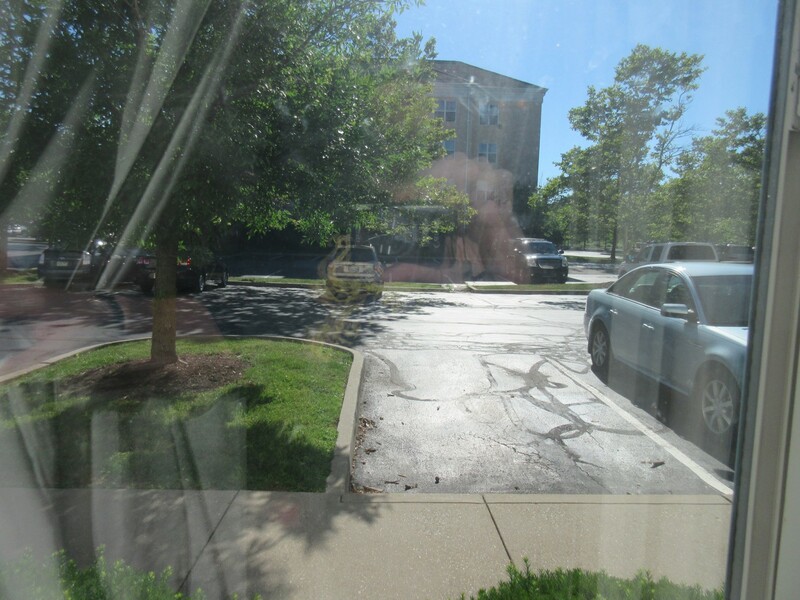 NIGHT ONE — ERIE, PA: Fairfield Inn by Marriott Erie Millcreek Mall. Erie is most proud of their campsites along Presque Isle, but camping has never been our thing. If you’re into shopping or having a lot of cheap franchise mealtime options, staying near a mall or in some heavily commercial area is a sensible choice. The surroundings won’t be much to brag about from a visual perspective, though. Mostly we had a view of the hotel next door. They put us in a first-floor ADA-compliant room with a hose and a chair instead of a shower, designed for nursing home residents on the go. We were told it was the only room left. NIGHT TWO — SYRACUSE, NY: Marriott Syracuse Downtown. Sometimes we stay in the suburbs to save money. 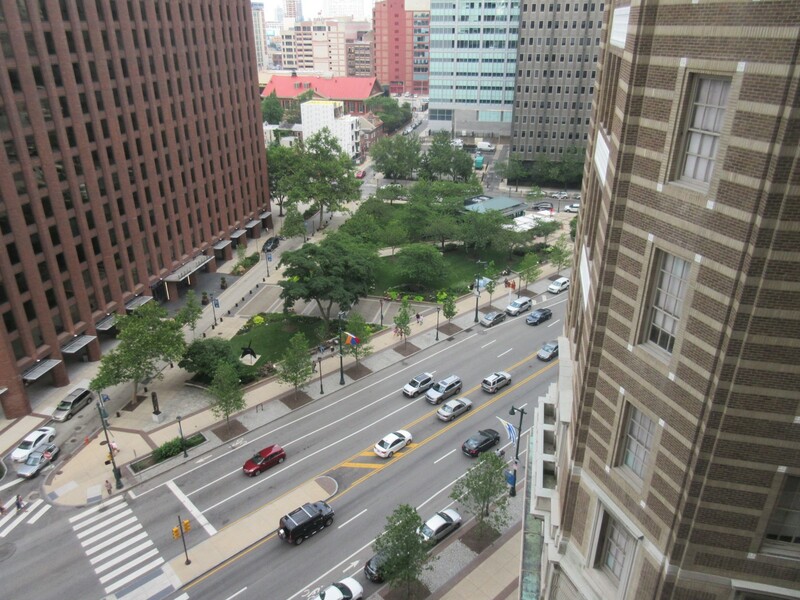 Sometimes we’ll stay at a downtown hotel so we can be closer to the action. Or “action”, in Syracuse’s case. Sunday night, everywhere around us was deserted except the festive Indian wedding in the lobby. 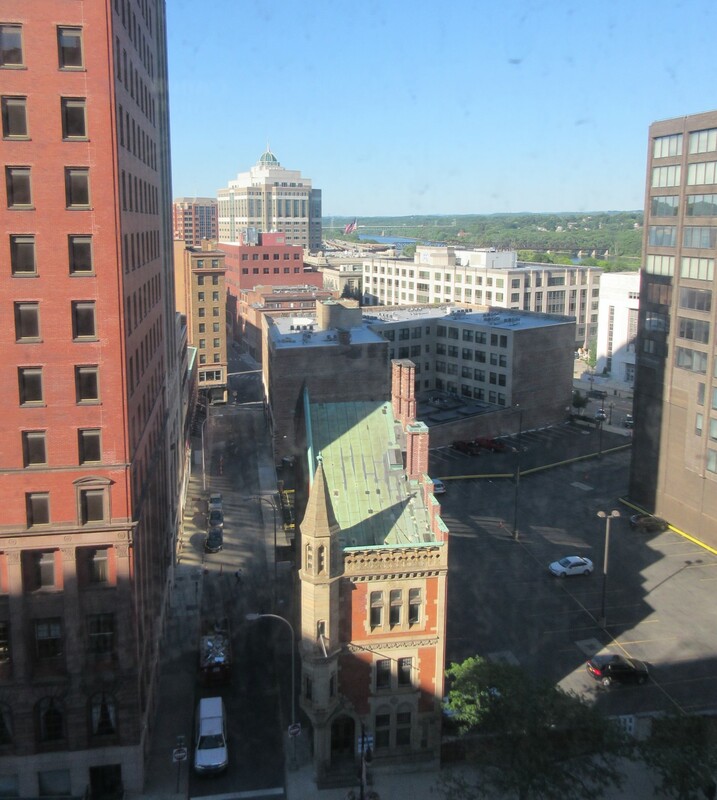 Our room was several stories up, with an uninspiring view that’s mostly the hotel’s own roof. I guess trees at sundown are okay? And there’s a mural way off in the distance we couldn’t make out. That lobby later in the evening, after things had quieted down. 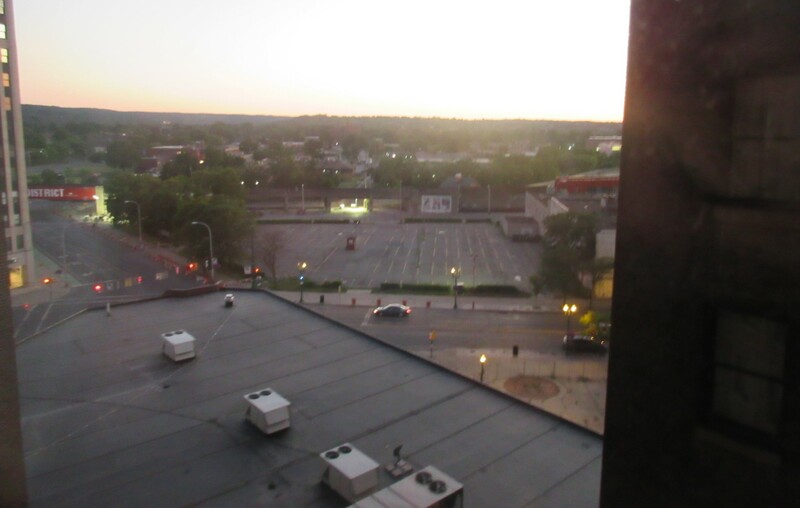 NIGHT THREE — ALBANY, NY: Fairfield Inn and Suites by Marriott Albany Downtown. They gave us such an enormous room, the kind probably reserved for local politicians whenever state government is in session, that I excitedly posted from it live at the time. Architecture all around, including a dead church or fancy tenement across the street. 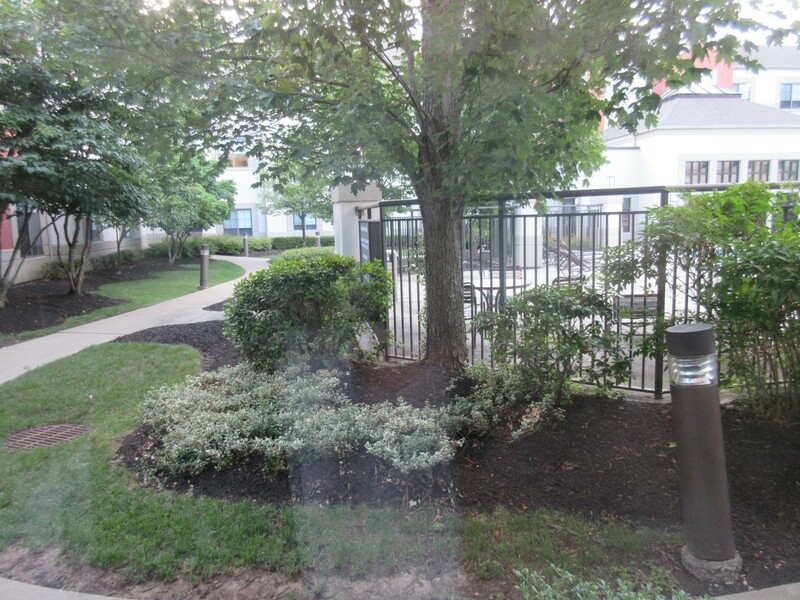 NIGHT FOUR — PARSIPPANY, NJ: Hyatt Place Parsippany. This extended-stay hotel gave us a full kitchen and multiple bedrooms even though there were only two of us. The excessive space was perhaps meant to compensate for the fact that we were in the middle of nowhere, no restaurants or sights for miles around, only highways and forests. The closest we got to a “different” sight were other guests who resembled Real Housewives cast members. Our exotic view of the center courtyard where the party people gather on weekends. This was a Tuesday night. 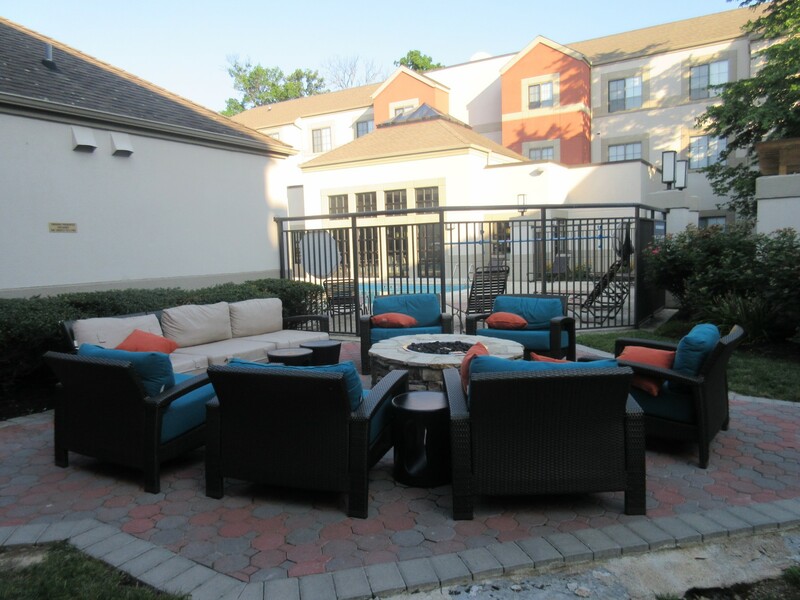 Love the patio furniture, regardless. 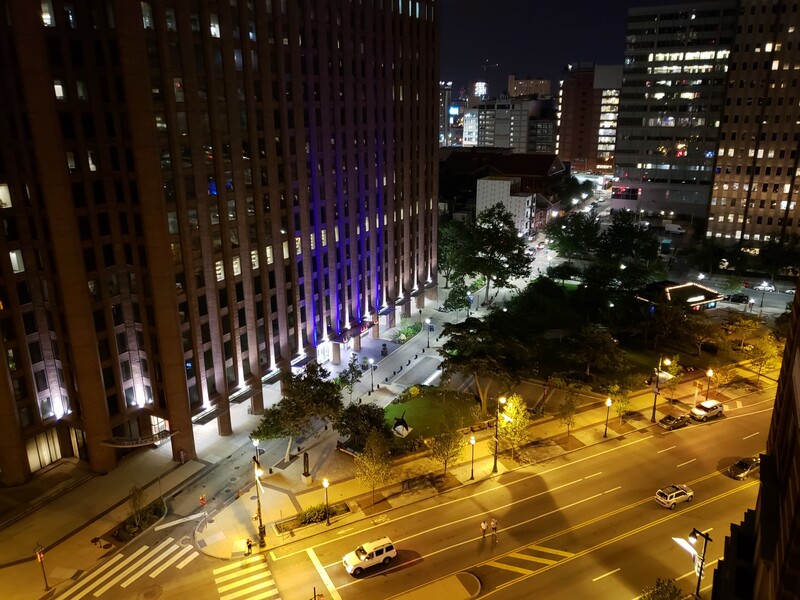 NIGHT FIVE — PHILADELPHIA, PA: Windsor Suites. On our first Philly foray in 2010, we stayed out in the suburbs in Exton and had to drive miles into the city through wretched rush-hour traffic squashed into far too few lanes. I resolved early in the planning process we weren’t doing that again. 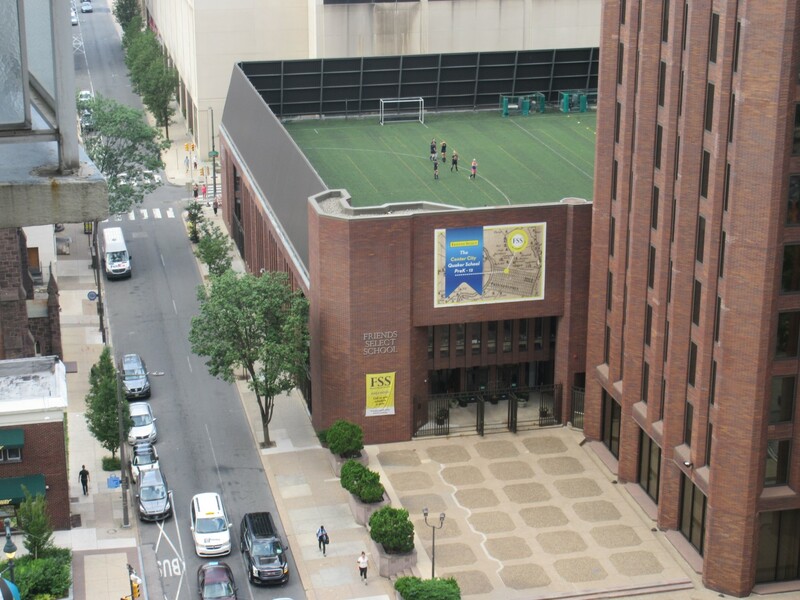 Instead we holed up in a skyscraper getaway off Benjamin Franklin Parkway — down the street from City Hall, multiple parks, and, as previously shared, several billion statues and sculptures. The price was surprisingly competitive and the decor flourished after a multimillion-dollar renovation completed earlier in 2018. 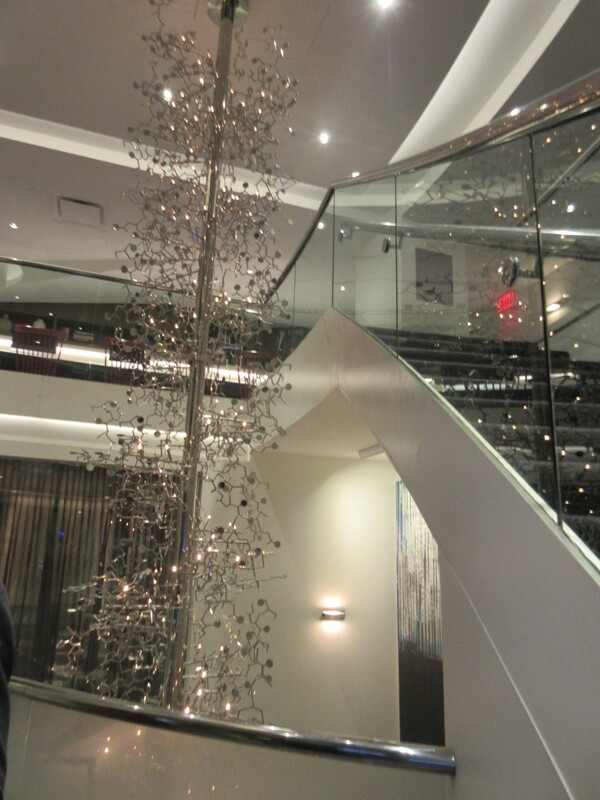 40-foot DNA tree in the lobby. 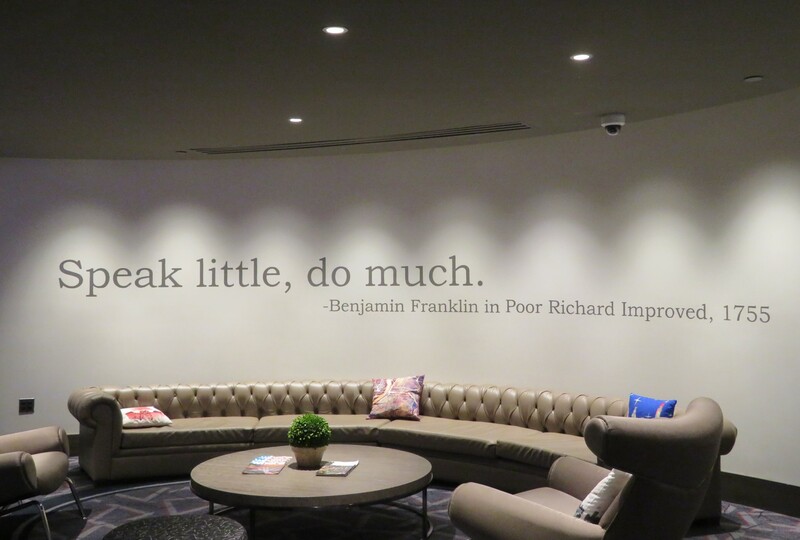 Also in the lobby: the spirit of Benjamin Franklin. Our room was a couple dozen stories up and featured an open-air balcony. We didn’t have to settle for peering through the glass. 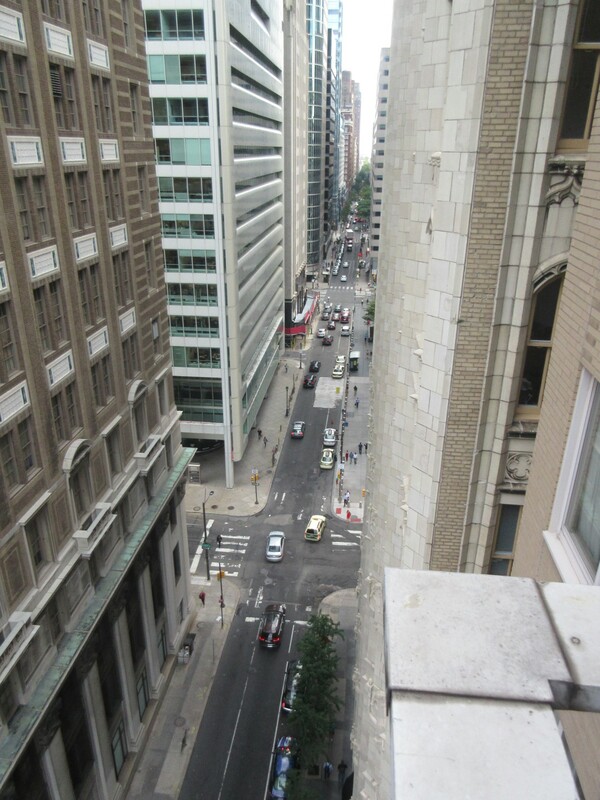 We could step out into fresh air and take in the sights and sounds of the City of Brotherly Love itself. Well, I could, anyway. Anne isn’t a big fan of heights. Our lead photo but in the daytime, a bird’s-eye view of Cret Park. To our north, Quaker teen soccer practice. I began to zoom in for a better picture till I realized a 40-something stranger secretly pointing a camera at girls from afar was, um, probably not a good look. To our south, 17th Street heads past numerous other skyscrapers. 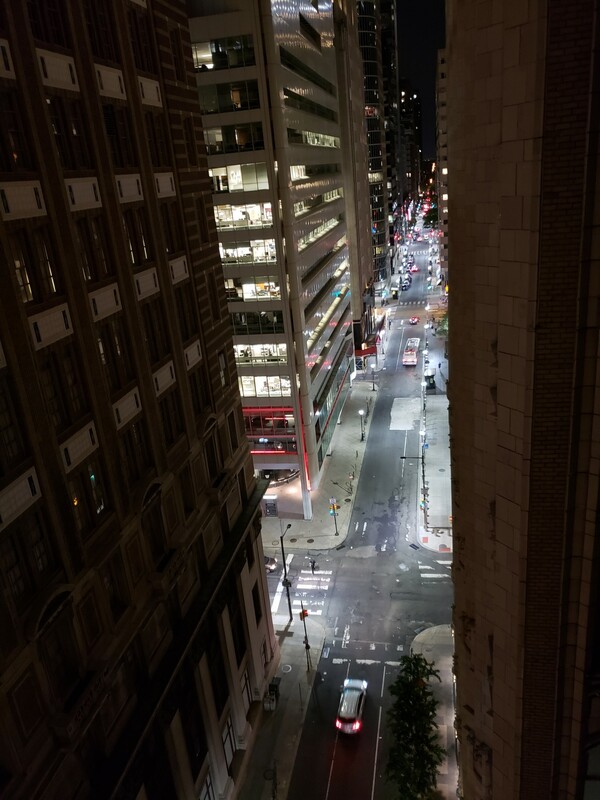 17th Street after dark. Also the lock screen on my phone. 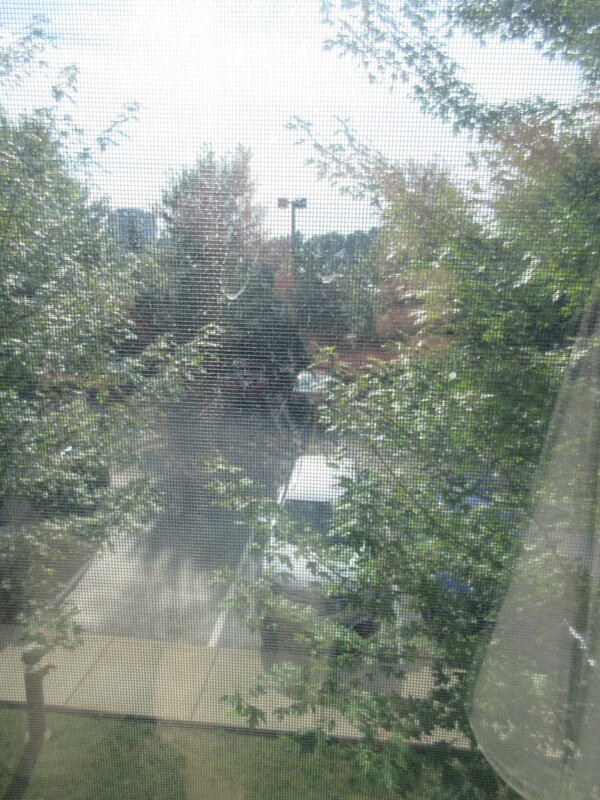 NIGHT SIX — MONROEVILLE, PA: Courtyard by Marriott Pittsburgh Monroeville. 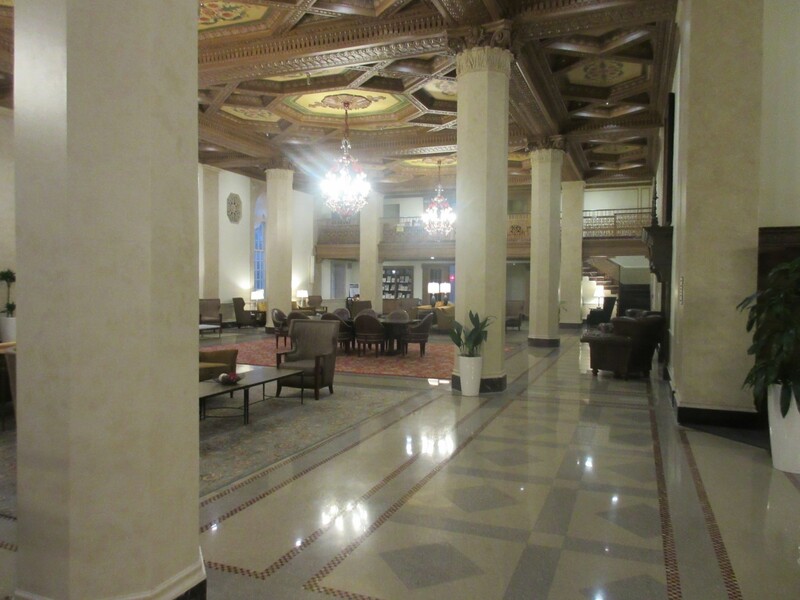 Full disclosure: our first choice for a grand finale was the Omni William Penn in downtown Pittsburgh, where we’d had a fabulous time the year before. Sadly, they were booked solid that evening, months in advance. Annoyingly rebuffed, instead we chose to end on a note of budget over luxury. Our final hotel of the trip was up on a hill invisible to westbound traffic, with a steep, narrow driveway and trees surrounding us, obscuring the rest of the outlying suburban area. This was no Omni. Not much to see between the trees and the screen. We gave up on the window and turned our gaze inward toward comfy beds and a rerun of Groundhog Day. Like Phill Connors’ long, life-changing experience, our holiday would soon end as well.